Home - I'm The Chef Too! Math, Science, Art & More! A Little Bit About What We Do . . .
I’m The Chef Too! offers highly engaging, hands on experiences for children of all ages. Our workshops and series are infused with critical thinking skills, conceptual understanding, and opportunities for real world application of content related concepts. 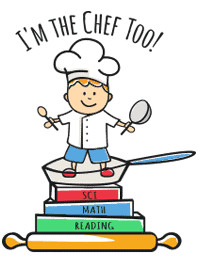 Will you be a master chef of mathematics and explore a variety of mathematical concepts in our kitchen, step into the role of a crazy mad science chef to discover scientific answers to tasty mysteries, or possibly become an artist and whip up delicious edible masterpieces? The choice is yours! Join us as we transform our kitchen into a tinker-lab with edible arts and crafts and sensory play! Calling all math lovers! Join our kitchen and become a master chef of mathematics. Grab a paintbrush and mix up some colors to create amazing works of art with food! Put on your lab coat and join us in the kitchen where you become the scientist! Don’t miss out on a chance to for a creepy crawler adventure as we explore the world of insects through food! Get Coupons and Registration Alerts, Too!